The past ten years have been a step by step process towards toxin-free living for me. Because of my sensitive skin I’ve always had to be mindful about the products that I use. Be it body care or cleaning products. In recent years I’ve replaced products such as creams, toothpaste, shampoo and deodorant by natural brands. And I started to make my own products. My skin has gone through impressive transformations since then. I finally seem to have my eczema-prone skin under control. Nutrition and lifestyle choices of course have a lot to do with this as well. Today I want to talk to you about soap and share this homemade lavender coconut milk body wash with you. 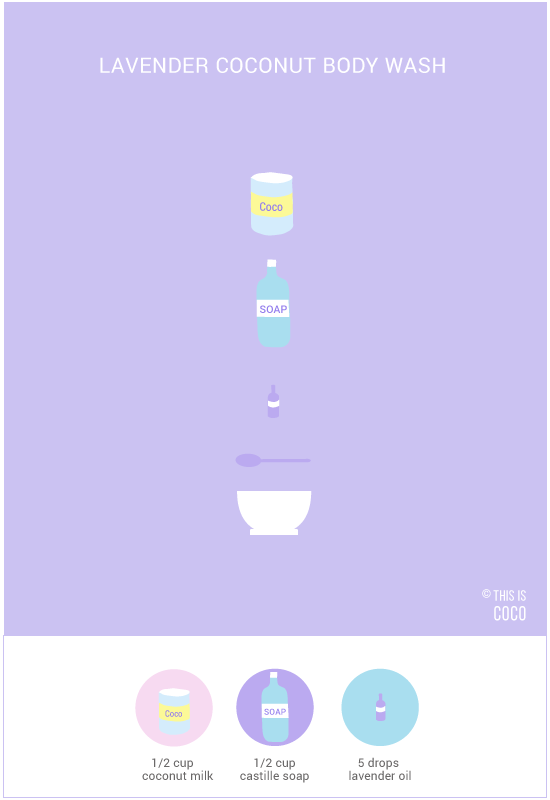 You only need 3 ingredients for it: coconut milk, castile soap and lavender essential oil. There are basically three soaps that I use: pure castile soap, African black soap and Moroccan sabon beldi. Five years ago I started using Dr. Bronner’s soap, which has done miracles for my skin. It’s a natural castile soap, made from pure organic ingredients, without any synthetics. Dr. Bronner’s soap is very concentrated and you need to dilute it with water or another liquid. It can be used in at least 18 ways in and around the house. Besides as a body wash, I use it to make my own laundry detergent, dish soap and to clean my house with. It’s very gentle on the skin and really gets your house clean too. I love dr. Bronner’s philosophy. They’re fair-trade, cruelty-free advocates of sustainability and human rights. It’s a brand that really cares about bringing forth positive changes for people, the planet and animals. They’ve been around for 5 generations of soapmaking and stay committed to their initial ideology. When I feel that my skin is in need of some extra care, I use my homemade lavender coconut milk body wash.
Castile soap is the base for it and I add coconut milk and lavender essential oil to it. I especially like using it during colder months or when my skin feels drier. Coconut milk is very rich in nutrients. It moisturizes and provides the skin with fatty acids, vitamins and minerals. This natural anti-aging milk has strong antimicrobial properties, which help keep bacteria, fungi and parasites away. Lavender is great for skin. It has healing, anti-aging and anti-inflammatory properties, improves blood circulation and soothes skin conditions such as eczema, psoriasis and acne. This homemade lavender coconut milk body wash is very gentle and can be used for all skin types. This is an easy one; just combine all the ingredients and mix them well. Pour the body wash in an empty soap bottle. This amount will last you for a few days / 1 week in the shower and a bit less if you use it in your bath tub.